integrated in a removable climate chamber. 3 000 kg usable payload ! 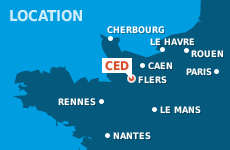 Since September 2018, the CED, managed by the CCI West Normandy integrates a new collaborative platform dedicated to the analysis of materials. Equipped with a new test bench very heavy load, it should allow to expand the vibratory activity to test complete heavy equipment and meet the requirements of “earthquake resistance”. This news will strengthen the competitiveness of the CED, in a global competitive environment and contribute to the economic development of the territory !